Dendritic cells (DCs), which maintain tolerance and orchestrate T cell immune responses, comprise a heterogeneous group of cells. For example, in the steady state, murine spleen contains pre-DC–derived CD8+ and CD8− conventional DCs. During inflammation, monocytes become activated and acquire some DC-like features, such as expression of CD11c and MHC class II. Although each of these cell types can present Ag, the relative efficiency of processing and presentation after Ag capture by different routes has not yet been systematically compared. To this end, we administered OVA to various conventional DCs and activated monocytes by receptor-mediated endocytosis, pinocytosis, or phagocytosis and measured internalization and presentation to MHC class I- and MHC class II-restricted T cells. We find that CD8− DCs are more efficient than any other type of APC tested in terms of presenting Ag to MHC class II-restricted T cells, irrespective of the route of Ag capture. In contrast, both subsets of splenic DCs are highly effective in cross-presenting Ags to CD8+ T cells. DCs and activated monocytes cross-presented Ags delivered by DEC205-mediated endocytosis and pinocytosis. However, DCs differ from activated monocytes in that the latter are several orders of magnitude less efficient in presenting Ags captured by phagocytosis to CD8+ or CD4+ T cells. We conclude that DCs derived from pre-DCs differ from monocyte-derived cells in that DCs process and present Ags efficiently irrespective of the route of Ag capture. Our observations have significant implications for understanding initiation of immune responses and vaccination strategies targeting DCs and activated monocytes. Dendritic cells (DCs) were first recognized by their unique morphology (1) and later shown to be potent stimulators of the MLR (2) and effector T cell responses (3, 4). Unlike macrophages or B cells, which are able to present Ag but are specialized for phagocytosis and Ab production, respectively, DCs are professional APCs (5–7). DCs are closely related to monocytes and macrophages; however, they develop from committed progenitors that diverge from monocytes and macrophages in the bone marrow (8) during the transition between macrophage-and-DC progenitor (9, 10) and common-DC progenitor (11, 12). Common-DC progenitors give rise to pre-DCs, which have lost the potential to produce plasmacytoid DCs (8). Pre-DCs circulate in the blood and seed lymphoid (8) and nonlymphoid organs (13–15), where they divide (16, 17) and differentiate into subpopulations of conventional DCs. In the lymphoid organs, DCs become incorporated into networks of cells and present Ag to migrating T cells (8, 18). In humans as well as in mice, DCs are a heterogeneous group of cells, composed of several subsets, all of which can express high levels of CD11c and MHC class II (MHC-II) (19). In the mouse spleen, resident DCs can be divided into two main subsets based on the expression of CD8α, DEC205, and DCIR2: CD8+DEC205+ and CD8−DCIR2+ DCs. In the steady state, both spleen DC subsets are derived from the same common progenitor, the pre-DC (8). However, during inflammation or infection the distribution of DCs in lymphoid organs changes, and monocytes can also acquire DC-like features, such as expression of CD11c, MHC-II, and costimulatory molecules (20–22). For example, during Listeria infection, monocytes differentiate in the spleen into TNF/inducible NO synthase-producing CD11c+ cells (tip-DCs) (23). Similarly, cells with many features of DCs can be derived from monocytes cultured with cytokines, such as GM-CSF (GM) and IL-4 (24, 25). However, the precise function of these activated monocytes in vivo remains to be defined. Although both subsets of conventional DCs found in the spleen excel in Ag processing and presentation, CD8−DCIR2+ DCs are more efficient than CD8+DEC205+ DCs in processing Ags for MHC-II presentation when Ags are captured by endocytic receptors (26). In contrast, CD8+DEC205+ DCs are superior in cross-presenting Ags to MHC class I (MHC-I) after ingestion of dead cells or during viral infection (27–29). However, the two subsets have not yet been compared systematically, either to each other or to other cells for presentation of Ags captured by different mechanisms. In this paper, we compare MHC-I and MHC-II Ag presentation by resting or activated spleen DCs, activated monocytes, GM and FLT3 ligand (FL) bone marrow culture-derived DCs, and activated B cells after Ag capture by either receptor-mediated endocytosis, pinocytosis, or phagocytosis. We find that all the different cell types tested can present Ags to MHC-II– or MHC-I–restricted T cells after Ag capture by DEC205-mediated endocytosis or pinocytosis, albeit with different efficiencies. However, Ags captured by phagocytosis are presented effectively only by conventional DCs. CD8−DCIR2+ DCs are the most efficient APCs for the MHC-II pathway, irrespective of activation status or mode of Ag acquisition. Finally, both major spleen DC subsets (CD8− and CD8+) are similar in cross-presentation, regardless of the route of Ag uptake. C57BL/6 mice were purchased from The Jackson Laboratory (Bar Harbor, ME). Transgenic OT-II, OT-I, CD11c-hDEC (26), B1-8hi (30) mice, as well as DEC-205–deficient and GM receptor-β–deficient (31) mice, were bred at the Rockefeller University; 6- to 10-wk-old mice were used in experiments. All experiments were performed in accordance with National Institutes of Health guidelines and approved by the Rockefeller University Animal Care and Use Committee. Chimeric anti–mouse-DEC205-OVA mAb (mDEC-OVA), anti–DCIR2-OVA mAb (DCIR2-OVA), and anti–human-DEC205-OVA mAb (hDEC-OVA) were expressed by transient transfection of 293T cells and purified with Protein G (GE Healthcare, Piscataway, NJ) as described (32). OVA (Grade V A5503; Sigma-Aldrich, St. Louis, MO) was decontaminated from LPS by multiple rounds of extraction with Triton-X 114 (Sigma-Aldrich) (33) and dialyzed extensively. 4-Hydroxy-3-nitrophenil (NP; Biosearch Technologies, Novato, CA) and biotin (Invitrogen, Carlsbad, CA) conjugation to OVA was performed according to the manufacturers’ instructions. All Ags were tested for LPS contamination (Fisher-Cambrex/Fisher Scientific, Pittsburgh, PA) and decontaminated by Triton-X 114 extraction when necessary. OVA was adsorbed to 2-μM red beads (Polysciences, Warrington, PA), according to the manufacturer’s protocol. Briefly, 0.5 ml 2.5% suspension of beads was resuspended in 0.1 M borate buffer pH 8.5 and incubated overnight with 500 μg OVA at 4°C. Alternatively, to obtain 25% OVA-beads, beads were incubated overnight with 125 μg OVA and 375 μg keyhole limpet hemocyanin (Sigma-Aldrich). Unbound protein was washed away extensively, and OVA-adsorbed beads were resuspended in 1 ml PBS. Coupling was confirmed by flow cytometry with rabbit anti-OVA (Cappel) Abs, followed by anti–rabbit-Cy5 staining (Jackson ImmunoResearch Laboratories, West Grove, PA). DCs were isolated from mice that had been injected 9–12 d before euthanasia with 1–2 × 106 B16-FL melanoma cells (34). All experiments (except those in Fig. 5) were also performed with DCs not expanded by FL isolated from uninjected control mice, with identical results. For in vivo Ag targeting experiments, mice were injected i.p. with 10 μg chimeric Abs 8–12 h before euthanasia. Activated DCs and monocytes were isolated from mice that were primed and boosted with methylated BSA (mBSA) in CFA (Difco/BD Diagnostics, Franklin Lakes, NJ) and then injected i.p. 24 h before analysis with 100 μg mBSA (Sigma-Aldrich), as described (22, 35). For DC and monocyte isolation, spleens were removed, injected with 0.4 U/ml collagenase D type II (Roche Biomedical Laboratories, Burlington, NC) in HBSS with 2% FCS (Life Technologies, Rockville, MD), cut into small fragments and incubated at 37°C for 30 min. Digestion was stopped, with 5 mM EDTA for 5 min, before collection of cell suspensions. RBCs were removed by ACK lysis (Life Technologies). All subsequent steps were performed in PBS 2% FCS, and during incubations, cells were kept at 4°C. Nonspecific binding was blocked with purified Fc block, and DCs were enriched with anti-CD11c beads (Miltenyi Biotec, Auburn, CA), according to the manufacturer’s instructions. Enriched naive CD11c+ cells were stained and sorted as follows: CD8+ DCs (B220−, NK1.1−, CD11chi, CD8+) and CD8− DCs (B220−, NK1.1−, CD11chi, CD8−, CD4+). Enriched CD11c+ cells from immunized mice were stained and sorted as follows: iMono (CD8−, CD11bhi, CD11cint, and Ly6C+), iCD8− DCs (CD8−, Ly6C−, CD11bint, and CD11chi), and iCD8+ DCs (CD8+, CD11chi and, Ly6C−). In addition, cells were stained with B220, NK1.1, CD3, Ter119, and Ly6G to gate out non-DCs/non-monocytes. In experiments with CD11c-hDEC mice, cells were also stained with human CD205 to sort positive cells. Sorted populations were collected in complete RPMI (RPMI 1640 supplemented with 10% FCS, 10 mM HEPES, 2 mM L-glutamine, antibiotic/antimycotic, 1 mM sodium pyruvate, and 53 μM 2-ME; Life Technologies), and live cells were typically >95% pure. Bone marrow cells were obtained by flushing femora and tibiae with RPMI 1640 supplemented with 5% FCS. RBCs were removed by ACK lysis (Life Technologies) and washed with complete RPMI 1640. For GM-DCs differentiation (24), bone marrow cells were plated at 1 × 106 cells/ml in complete RPMI 1640 with 3% vol/vol supernatant of J558L cells transduced with murine GM (provided by A. Lanzavecchia, Institute for Biomedical Research, Bellinzona, Switzerland). Cells were cultured at 37°C and 5% CO2. Media were changed every 2 d, removing loosely adherent and dead cells. GM-DCs were collected at day 7. Nonspecific binding was blocked with Fc block, and cells were stained with CD11c. CD11chi cells were sorted. For FL-DC differentiation (36), bone marrow cells were plated at 1.5 × 106 cells/ml in complete RPMI 1640 with 100 ng/ml recombinant murine FL. FL was obtained by anti-FLAG purification of supernatant from Chinese hamster ovary (CHO) cells expressing recombinant murine FL-FLAG (kindly provided by C.G. Park, The Rockefeller University). Cells were cultured at 37°C and 5% CO2, and FL-DCs were collected at day 10. Nonspecific binding was blocked with purified Fc block, and cells were stained and sorted as follows: FL-CD8− DCs (B220−, CD11chi, SIRPαhi, and CD24lo) and FL-CD8+ DCs (B220−, CD11chi, SIRPαlo, and CD24hi) (37). In vitro activation of DCs was by addition of 1 μg/ml LPS (Sigma-Aldrich) for the last 18 h of culture. In experiments with CD11c-hDEC mice, cells were also stained with human CD205 to sort positive cells. Sorted populations were collected in complete RPMI 1640, and live cells were typically >95% pure. Naive B cells were isolated from wild-type (WT) C57BL/6 mice or B1-8hi mice, as indicated. For WT mice, single-cell suspensions from spleen were incubated with anti-CD43 beads (Miltenyi Biotec) and enriched in LS Columns for CD43− naive B cells. For B1-8hi mice, single-cell suspensions from spleen and skin-draining lymph nodes were incubated with anti–Igκ-PE (187.1; BD Biosciences, San Jose, CA), followed by anti-PE (Miltenyi Biotec) beads and anti-CD43 beads (38). Cells were enriched in LS Columns (Miltenyi Biotec) for CD43−Igκ− naive λ+ B cells (NP-specific). Enriched B cells were plated at 0.7 × 106 cells/ml in complete RPMI 1640 supplemented with 25 μg/ml LPS (Sigma-Aldrich) and 5 ng/ml IL-4 (Sigma-Aldrich) and cultured at 37°C and 5% CO2 for 2–3 d.
Enriched CD11c+ cells from spleen (naive control or immunized mice) or GM-DCs were incubated with OVA-adsorbed beads at 108 cells/ml in complete RPMI a640, for 30 min at 37°C and 5% CO2. Cells were washed 3 times with cold PBS (900 rpm, 5 min) and stained for cell sorting, as described above. Sorted APCs were counted, and 15,000 live cells/well were plated in complete RPMI 1640 in 96-well round-bottom plates. For B cell blasts, 30,000 live cells/well were plated. Ag was added at the indicated concentrations. For receptor-mediated endocytosis (DEC-205 targeting and BCR targeting), all media were kept cold and Ag was pulsed for 20 min at 4°C. For pinocytosis, warm media with Ag (OVA-biotin) were added, and plates were incubated at 37°C with 5% CO2 for 2 h. As controls in all experiments, APCs were also incubated with peptides for 20 min at 4°C: For OTI coculture we used OVA peptide EQLESIINFEKLTEW, and for OTII coculture we used OVA peptide LSQAVHAAHAEINEAGR, synthesized by the Proteomics Resource Center, The Rockefeller University. After Ag or peptide incubation, cells were washed 3 times with complete RPMI 1640 to remove excess free Ag, before assessment of Ag uptake or before incubation at 37°C and 5% CO2, with OVA-specific T cells. All incubations were done in duplicate wells. CD8+ and CD4+ OVA-specific T cells were isolated from OTI and OTII mice, respectively. CD8+ and CD4+ T cells were enriched with a CD8+ T cell isolation kit or a CD4+ T cells isolation kit, according to the manufacturer’s instructions (Miltenyi Biotec) with the addition of anti–CD11c-biotin to the Ab mixture. Enriched T cells were labeled with 1 μM CFSE (Molecular Probes/Invitrogen) in PBS 0.1% BSA for 10 min at 37°C. The reaction was quenched with FCS, and cells were washed 2–3 times with complete RPMI 1640. 100,000 to 125,000 T cells were added to each well containing APCs. Activation and division of OVA-specific T cells were determined by flow cytometry after culture at 37°C and 5% CO2 for 60–65 h (OTI cells) or 80–85 h (OTII cells). For analysis, cells were stained with Va2 PE, CD69 APC, CD8 or CD4 PerCP, and 0.5 μg/ml DAPI before acquisition on LSR II (BD Biosciences). After removal of free Ag, APCs were resuspended in cytofix/cytoperm (BD Biosciences) for 15 min at room temperature and washed in Perm/Wash (BD Biosciences) and then in PBS 1% BSA 0.1% saponin. αDEC-OVA and NP-OVA captured by receptor-mediated endocytosis were detected with rabbit polyclonal anti-OVA (Cappel) followed by F(ab)′2 donkey anti-Rabbit IgG-HRP (Jackson ImmunoResearch Laboratories). OVA-biotin was detected with streptavidin-HRP (Jackson ImmunoResearch Laboratories). HRP content was assessed by a fluorometric assay with amplex red (Invitrogen). Plates were excited at 530 nm, and emission was collected at 590 nm on Cytofluor II (PerSeptive Biosystems, Ramsey, MN). The following Abs, purchased from either BE Biosciences or eBioscience (San Diego, CA), were used: CD3 (145-2C11), CD4 (L3T4), CD8 (53-6.7), CD11b (M1/70), CD11c (N418, HL3), CD16 and CD32/Fc block (2.4G2), CD19 (MB19-1 or eBio1D3), CD24/HSA (M1/69), CD45R/B220 (RA3-6B2), CD45.1 (A20), CD45.2 (104), CD69 ([1H].2F3), CD86 (GL1), CD115/CSF-1R (AFS98), CD135/Flk-2/Flt3 (A2F10), CD172α/SIRPα (P84), mouse CD205/mDEC-205 (205yefta), human CD205/hDEC-205 (Mg38), DCIR2 (33D1), Fas/CD95 (Jo2), GL7, H2Kb (AF6-88.5), Ly6C (AL-21 or HK1.4), Ly6G (1A8), MHC-II (AF6-120.1 or M5/114.15.2), NK1.1 (PK136), Ter-119, and Vα2 (B20.1). Streptavidin-PE and –PE-Cy5.5 were from eBioscience. Streptavidin APC was from BD Biosciences. Streptavidin Pacific Blue and DAPI were from Invitrogen. Data were acquired on LSR-II (BD Biosciences). Analysis was performed using Diva (BD Biosciences) or FlowJo (TreeStar, Ashland, OR). Graphs were compiled on Prism software (GraphPad Software, San Diego, CA). Ag pulse curves representing Ag uptake or T cell proliferation were adjusted to exponential one-phase association curves. Statistical analysis was performed using Prism software, as described in each figure. CD8+ DCs excel in cross-presentation during infection with HSV and West Nile virus or after ingestion of apoptotic cells (27–29, 39, 40). 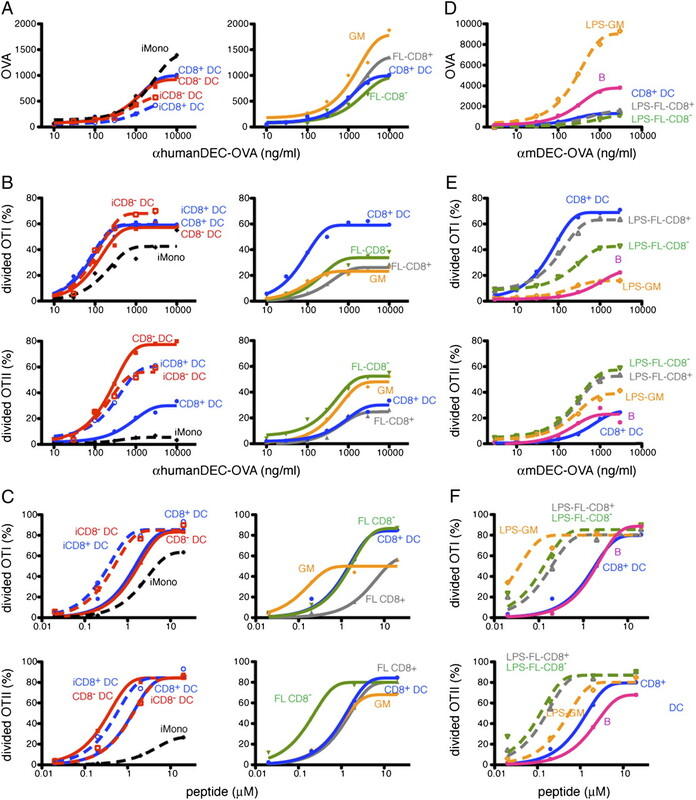 However, both CD8+ and CD8− DCs can cross-present when they are incubated with high concentrations of soluble OVA (41), OVA immune complexes (42), or bacteria expressing OVA (40, 43). Whether these differences are related to the amount of Ag acquired, the mechanism of uptake, or some other cell intrinsic difference between the two DC subsets is not known. To compare the Ag-presenting activity of the different DC subsets after receptor-mediated endocytosis, we made use of mice that express human DEC-205 under the control of the CD11c promoter (CD11c-hDEC) because all DC subsets in these mice express hDEC-205 (26). OVA was targeted to DCs in vivo by injecting chimeric anti–human-DEC-205 mAbs that carry intact OVA (αhDEC-OVA). As controls we used anti–mDEC-OVA and anti–DCIR2-OVA, which target either CD8+ or CD8− DCs in the spleen, respectively (26, 32). Following Ab injection, hDEC expressing CD8− and CD8+ splenic DCs were purified by cell sorting and evaluated for MHC-I or MHC-II presentation by coculture with CFSE-labeled OVA-specific OTI and OTII transgenic T cells. As previously documented, CD8− DCs targeted in vivo with anti–DCIR2-OVA efficiently induced OTII proliferation but little OTI proliferation, whereas CD8+ DCs targeted in vivo with anti–mDEC-OVA induced robust OTI and more modest OTII proliferation (Fig. 1) (26). Consistent with the low but detectable levels of mDEC-205 expressed by CD8− DCs (Supplemental Fig. 1A) (44), we found small amounts of cross-presentation by CD8− DCs upon anti–mDEC-OVA targeting (Fig. 1A). 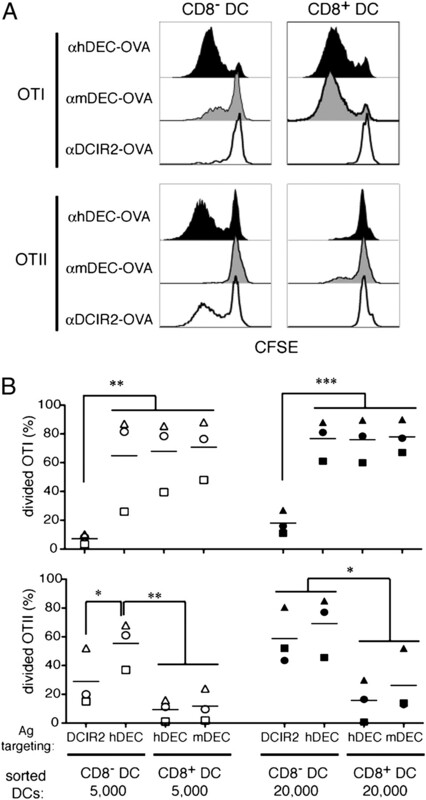 When both DCs were targeted with anti–hDEC-OVA, CD8− DCs were more effective at stimulating OTII proliferation than were CD8+ DCs from the same mice (Fig. 1) (26). In contrast, both CD8− and CD8+ DCs targeted in vivo with anti–hDEC-OVA elicited similarly robust levels of OTI proliferation (Fig. 1). These results indicate that both DC subsets have the same intrinsic potential to cross-present Ags when the Ag is delivered by DEC-205. hDEC205-mediated endocytosis in vivo promotes cross-presentation by both CD8− and CD8+ DC subsets. 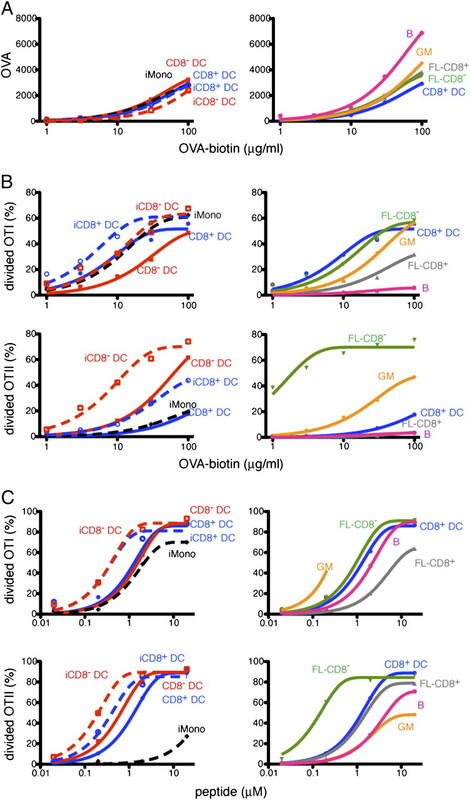 A, Representative histograms show proliferation as measured by CFSE dye dilution of OTI (upper panels) and OTII (lower panels) T cells upon culture with 5 × 103 CD8− or CD8+ DCs isolated from CD11c-hDEC transgenic mice injected with anti–hDEC-OVA (αhDEC-OVA), anti–mDEC-OVA (αmDEC-OVA), or anti–DCIR2-OVA (αDCIR2-OVA), as indicated. B, Summary of three independent experiments as in A. Panels show the percentage of divided, CFSE low OTI (upper panel) and OTII (lower panel) after incubation with 5 × 103 (○, □, △) or 20 × 103 (●, ▪, ▴) CD8− or CD8+ DCs that were targeted with OVA, as indicated. Each symbol indicates independent experiments and represents the average of duplicate measurements. Spleens of 3–10 injected mice were pooled in each experiment. Data were analyzed by repeated measures with ANOVA, and Tukey’s test was used to compare groups. *p < 0.05; **p < 0.01; ***p < 0.001. Although both subsets of DCs express similar levels of hDEC-205 in the CD11c-hDEC transgenic mice (26), differences in Ag presentation may nevertheless be the result of differences in the amounts of Ag captured. To explore this possibility, we isolated spleen CD8− and CD8+ DCs from CD11c-hDEC mice, pulsed them at 4°C with varying amounts of anti–hDEC-OVA, and measured the amount of cell-associated OVA (Fig. 2A, left). Replica plates of the pulsed DCs were then cocultured with CFSE-labeled OTI or OTII transgenic T cells at 37°C for 3–4 d to measure their ability to present OVA (Fig. 2B, left). As a further control, DCs were pulsed with peptides to measure their Ag-presenting activity independent of Ag capture and processing (Fig. 2C, left). Ag presentation after DEC205-mediated endocytosis in vitro. A–C, APCs from CD11c-hDEC mice were isolated from naive (solid lines) or mBSA-CFA–immunized (dashed lines) mice (left panels), or cultured from bone marrow (right panels). A, The y-axis shows relative cell-associated OVA, as measured by rabbit anti-OVA and developed with anti–rabbit-HRP, after targeting with the indicated concentrations of αhDEC-OVA on the x-axis. B, Activation and proliferation of OTI (upper panels) and OTII (lower panels) T cells in response to OVA containing APCs. The y-axis shows the percentage of divided T cells. C, Graphs show OTI (upper panels) and OTII (lower panels) T cell proliferation in response to peptide pulsed APCs. D–F, APCs were isolated or cultured from spleen or bone marrow of WT mice. D and E, As in A and B, but targeting was with αmDEC-OVA. F, As in C. A–F, Graphs represent pooled data from three to seven independent experiments. CD8− and CD8+ splenic DCs captured similar amounts of OVA when pulsed with anti–hDEC-OVA (Fig. 2A, left) and showed similar intrinsic Ag-presenting activity when pulsed with peptides (Fig. 2C, left). When Ag was titrated under conditions when DCs were present in excess, the results of in vitro targeting mirrored those obtained in vivo in that the two subsets were equivalent for MHC-I cross-presentation and also that CD8− DCs were intrinsically more efficient than CD8+ DCs in processing and presenting Ags on MHC-II (Fig. 2B, left; Supplemental Fig. 2A). Only small differences in presentation were found when the number of APCs were titrated: CD8+ DCs were ∼3-fold more effective than CD8− DCs for cross-presentation when <10,000 DCs were present (Supplemental Fig. 2B, upper panels). In contrast, CD8− DCs were several orders of magnitude more efficient than CD8+ DCs for MHC-II presentation, irrespective of the number of DCs assayed (Supplemental Fig. 2B, lower panels). We conclude that CD8− and CD8+ splenic DCs are similar in terms of their ability to cross-present Ags on MHC-I when the Ag is captured by DEC-205. During some infections or inflammation, monocytes become activated and can differentiate into GM-dependent tip-DCs (22, 23, 35, 45) (Supplemental Fig. 3). Conversely, conventional DCs are FL dependent, GM independent, and derived from pre-DCs (16). To compare activated monocytes with conventional DCs, we immunized hDEC-205 transgenic mice with CFA (35) to induce monocyte activation. Activated monocytes and conventional DCs were purified by cell sorting and compared after targeting with anti–hDEC-OVA. Activated monocytes had similar levels of CD86, 2-fold higher levels of MHC-I, but lower levels of MHC-II when compared with conventional DCs from naive control mice (Supplemental Figs. 3C, 4). Conventional DCs isolated from the immunized mice (iCD8+ and iCD8− DCs) had higher levels of CD86, MHC-I and MHC-II when compared with control DCs (Supplemental Figs. 3C, 4). All cell types isolated from the immunized mice (iCD8+ and iCD8− DCs, and iMono) were similar to control DCs in Ag uptake after anti–hDEC-OVA targeting (Fig. 2A, left) (46). However, DCs from immunized mice were more efficient than their naive counterparts with regard to the presentation of pulsed peptides. In contrast, activated monocytes were less efficient than DCs, especially for MHC-II presentation, when pulsed with peptides (Fig. 2C, left). Consistent with the peptide presentation experiments, activated monocytes performed poorly in MHC-II presentation, but showed levels of cross-presentation that approached those of conventional DCs (Fig. 2B, left). We conclude that activated monocytes resemble conventional DCs in their ability to cross-present Ags captured by DEC205-mediated endocytosis. However, under the same conditions, activated monocytes are far inferior to naive or activated conventional spleen DCs with regard to MHC-II presentation. DCs obtained by culturing murine bone marrow cells with GM are widely used as APCs (24). A second method for producing DCs in vitro involves murine bone marrow culture in the presence of FL (FL-DCs) (36). FL-DCs are heterogeneous, and contain cells that resemble CD8+ and CD8− splenic DCs (FL-CD8+ and FL-CD8− DCs, respectively), as well as plasmacytoid DCs in terms of cell surface marker and transcription factor expression (37, 47). Both FL- and GM-DCs can be activated with TLR agonists, such as LPS, to increase the expression of MHC and costimulatory molecules (36, 48, 49), as well as Ag processing (50, 51) and the stability of MHC-peptide complexes on the cell surface (6, 52). Moreover, endogenous mouse DEC-205 expression is induced on cultured DCs upon TLR ligation (36, 53). To compare the ability of tissue culture-derived DCs and conventional DCs to present Ags captured by receptor-mediated endocytosis, we targeted GM- and FL-DCs obtained from hDEC transgenic mice with anti–hDEC-OVA. CD86, MHC-I, and MHC-II expression by GM- and FL-DCs was equal to or higher than that in spleen DCs (Supplemental Fig. 4). However, GM-DCs accumulated more OVA than did spleen DCs or FL-DCs after anti–hDEC-OVA targeting (Fig. 2A, right). Nevertheless, GM-DCs were less effective than spleen DCs in cross-presentation (Fig. 2B, right; Supplemental Fig. 2A). Consistent with their high levels of MHC-II expression, GM-DCs were efficient in presenting pulsed peptides to MHC-II–restricted T cells (Fig. 2C, right). However, the same cells were intermediate, between CD8+ and CD8− DCs, for MHC-II presentation after Ag capture by DEC205-mediated endocytosis (Fig. 2B, right; Supplemental Fig. 2A). FL-DCs were separated into CD8− (Sirpαhi) and CD8+ (CD24hi) subsets. Both FL-DC subsets induced less OTI proliferation than did splenic DCs (Fig. 2B, right). However, FL-CD8+ DCs were almost 10-fold less efficient than their splenic counterparts for MHC-I presentation after exogenous peptide loading (Fig. 2C, right). For MHC-II presentation, FL-CD8− DCs were more efficient than FL-CD8+ DCs, the latter showing efficiency similar to that of their splenic counterpart CD8+ DCs (Fig. 2B, right). We conclude that both GM- and FL-DCs are capable of MHC-I and MHC-II presentation when Ag is captured by DEC205-mediated endocytosis; however, these cells are less active than conventional spleen DCs. To determine how activation by TLR ligation alters DCs ability to present Ags acquired through receptor-mediated endocytosis, we stimulated GM- or FL-DCs with LPS and measured Ag presentation after targeting with anti–mDEC-OVA. Naive CD8+ DCs from spleen were used as controls in all experiments. As expected, stimulation with LPS enhanced expression of MHC-I and MHC-II and costimulatory molecules in all culture-derived DCs (Supplemental Fig. 4) (6). GM-DCs activated with LPS expressed high levels of DEC-205 and thus captured more Ag than any of the other DCs tested (Fig. 2D). In addition, when loaded with exogenous peptide, LPS-GM-DCs performed better than control CD8+ DCs in activating MHC-I– and MHC-II–dependent T cell responses (Fig. 2F). However, LPS-GM-DCs were far less effective than CD8+ DCs and no better than resting GM-DCs in cross-presentation of Ags acquired by DEC205-mediated endocytosis (Fig. 2E, Supplemental Fig. 2C). Finally, LPS stimulation also decreased the relative efficiency of GM-DCs with regard to processing Ag to be presented on MHC-II (Fig. 2E). LPS-FL-DCs captured similar amounts of Ag as control splenic CD8+ DCs (Fig. 2D), but showed increased activation of MHC-I– and MHC-II–restricted T cells after peptide loading (Fig. 2F). Surprisingly, LPS stimulation had a positive impact on Ag presentation on FL-CD8+, but not on FL-CD8− DCs (Fig. 2E, Supplemental Fig. 2C). In conclusion, LPS failed to enhance MHC-I and MHC-II presentation by all cultured DCs, with the exception of FL-CD8+ DCs. B cells express constitutive low levels of DEC-205 (53) but increase DEC-205 expression upon activation: Germinal center B cells have higher DEC-205 expression than naive B cells (Supplemental Fig. 1A), and B cells express high levels of DEC-205 after culture with LPS and IL-4 or anti-CD40 and IL-4 (Supplemental Fig. 1B). LPS/IL-4 activated B cells, which also expressed higher levels of CD86, MHC-I, and and MHC-II than did splenic DCs (Supplemental Fig. 4), were compared with DCs for Ag processing and presentation after targeting with anti–mDEC-OVA. Activated B cells captured more Ag than did CD8+ DCs (Fig. 2D), and were equivalent to CD8+ DCs in presenting exogenously loaded peptide to MHC-I– and MHC-II– restricted T cells (Fig. 2F). Consistent with these observations, activated B cells were also similar to CD8+ DCs in Ag presentation to MHC-II–restricted T cells after Ag targeting to DEC-205 (Fig. 2E). However, B cell blasts induced far less OTI proliferation and were much less efficient than DCs in cross-presentation (Fig. 2E, Supplemental Fig. 2C). When the relative amount of Ag uptake is taken into account, similar results were obtained for MHC-II presentation for Ags targeted to the B cell AgR instead of DEC-205 (Fig. 3A, 3B) on B cells from B1-8hi mice, specific for NP (30). However, Ag captured by DEC-205 was approximately 3 times more efficient than the B cell AgR for cross-presentation (Fig. 3A, 3B). This difference is not dependent on BCR cross-linking, because αDEC-OVA, together with BSA-NP, was equivalent to αDEC-OVA alone. DEC205-mediated endocytosis promotes cross-presentation in B cells. NP-specific B cells were isolated from B1-8hi transgenic mice and stimulated with LPS and IL-4 for 50–60 h. A, The y-axis shows relative cell-associated OVA, after targeting with the indicated concentrations of αmDEC-OVA, or αmDEC-OVA and BSA-NP, or OVA-NP on the x-axis. Maximum cell-associated OVA was normalized to 100 in each experiment. 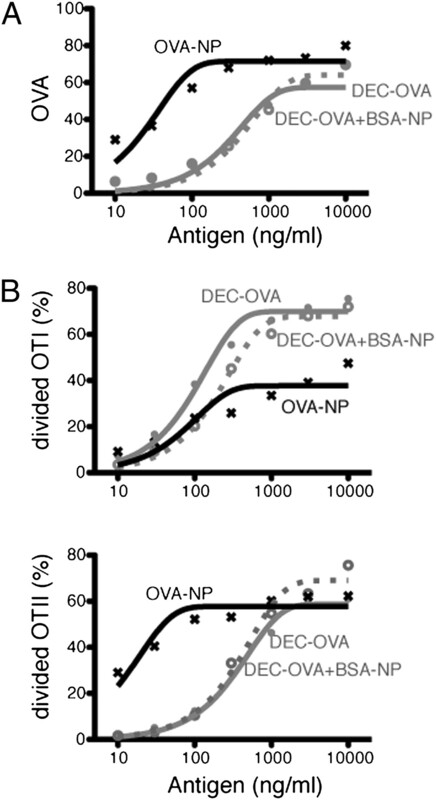 B, Activation and proliferation of OTI (upper panel) and OTII (lower panel) T cells in response to OVA-containing B cells. The y-axis shows the percentage of divided T cells. A and B represent pooled data from three independent experiments. We conclude that, when Ag is captured by DEC205-mediated endocytosis, FL-DCs (both CD8+ and CD8−) resemble conventional spleen DCs with regard to efficiency of Ag presentation. Furthermore, Ag delivery by endocytosis through DEC-205 is not sufficient to ensure efficient cross-presentation, because B cells and LPS-GM-DCs were almost 10-fold less effective in cross-presentation than splenic DCs. To determine whether the observed differences in Ag presentation were cell intrinsic or dependent on the route of Ag capture, we loaded cells with Ag by pinocytosis, using high concentrations of soluble OVA (up to 100 μg/ml). Although some preparations of OVA display mannose residues that serve as ligands for mannose receptors, we found no detectable binding at 4°C of our OVA preparation to any of the cell types tested (Supplemental Fig. 5A, 5B). Both spleen DC subsets obtained from naive and immunized mice showed similar levels of OVA endocytosis after incubation at 37°C (Fig. 4A, left). Despite their similarities in Ag uptake and presentation of exogenous peptides, OVA captured by bulk pinocytosis was presented more effectively by CD8− than CD8+ DCs to MHC-II–restricted T cells (Fig. 4B, 4C, left). In addition, DCs obtained from immunized mice were more efficient in MHC-II Ag presentation than were naive DCs, but the differences between the subsets did not change qualitatively (Fig. 4B, left). Therefore, CD8− DCs are more efficient than CD8+ DCs at presentation to MHC-II–restricted T cells, irrespective of the route of Ag uptake or activation status. Ag presentation after pinocytosis. APCs were isolated from spleen or cultured from bone marrow or spleen of WT mice. A, The y-axis shows relative cell-associated OVA, developed with streptavidin-HRP, after incubation of APCs with the indicated concentrations of OVA-biotin on the x-axis. B, Activation and proliferation of OTI (upper panels) and OTII (lower panels) T cells in response to OVA-containing APCs. The y-axis shows the percentage of divided T cells. C, Graphs show OTI (upper panels) and OTII (lower panels) T cell proliferation in response to peptide pulsed APCs. A–C represent pooled data from three to five independent experiments. Despite Ag uptake at levels similar to that in conventional DCs, activated monocytes showed low levels of MHC-II presentation of pinocytosed Ag, which correlated with low levels of presentation with pulsed peptide (Fig. 4, left). However, activated monocytes were similar to spleen DCs for cross-presentation (Fig. 4B, left). We conclude that activated monocytes can cross-present pinocytosed Ags as efficiently as spleen DCs; however, these cells are far less effective in MHC-II presentation when Ag is captured by either DEC205-mediated or bulk phase endocytosis. Among cultured DCs, FL-DCs acquired amounts of OVA by pinocytosis similar to what their spleen DC counterparts acquired (Fig. 4A, right). Whereas FL-CD8− DCs were equivalent to spleen DCs for cross-presentation and far more efficient with regard to MHC-II presentation of pinocytized Ag, FL-CD8+ DCs were less effective in both tasks (Fig. 4B, right; Supplemental Fig. 5C). GM-DCs accumulated similar amounts of OVA by bulk phase pinocytosis and performed similarly to CD8+ DCs for cross-presentation and intermediate between the two DC subsets for MHC-II presentation (Fig. 4A, 4B, right). In contrast, activated B cells, which were active in endocytosis and presentation of peptides, were nearly inactive in processing Ag acquired by bulk phase pinocytosis for presentation on MHC-II or MHC-I (Fig. 4, right; Supplemental Fig. 5C). Therefore, we conclude that both the cell type and the route of endocytosis influence the efficiency of Ag presentation. To further analyze the effects of the route of Ag uptake on Ag presentation, we delivered OVA to APCs by phagocytosis of OVA-adsorbed polystyrene beads. Flow cytometry was used to purify cells that had captured a single fluorescent bead to normalize the amount of Ag captured. Internalization was confirmed by analysis on Image Stream cytometry (Supplemental Fig. 6). Naive and activated splenic DCs presented Ag acquired by phagocytosis in a manner that was similar to Ag captured by DEC205-mediated or bulk phase pinocytosis (Fig. 5A). CD8− DCs remained more efficient than CD8+ in MHC-II presentation, and cross-presentation was similar in both types of DCs (Fig. 5A). Decreasing the amount of OVA on the beads did not alter the results (Fig. 5B). However, neither activated monocytes nor GM-DCs, nor LPS-activated GM-DCs, presented phagocytized Ags to MHC-I– or MHC-II–restricted T cells to any appreciable degree (Fig. 5A). Similar results were obtained when we assayed splenic monocytes from Listeria-infected mice (tip-DCs) (Supplemental Fig. 7). We conclude that activated monocytes and GM-DCs are far less effective in Ag presentation than are conventional DCs when the Ag is acquired by phagocytosis. Ag presentation after phagocytosis. A, APCs were isolated from spleen of naive or mBSA-CFA–immunized mice. GM-DCs were derived from bone marrow. Enriched populations were incubated with OVA-beads before sorting. Panels show activation and proliferation of OTI (left panels) and OTII (right panels) T cells after incubation with the indicated number of APCs in the x-axis, that were sorted to contain a single OVA-bead. The y-axis shows the percentage of divided T cells. In lower panels, each symbol indicates independent experiments and represents the average of duplicate measurements where 2500 sorted APCs were incubated with T cells. Data were analyzed by ANOVA, and Tukey’s test was used to compare groups. *p < 0.05; ***p < 0.001. B, As in A, but DCs from naive mice were incubated with beads adsorbed with 25% OVA and 75% keyhole limpet hemocyanin protein. A and B represent pooled data from two to seven independent experiments. We have systematically compared conventional spleen DCs with tissue culture-derived DCs and with activated monocytes for presentation of Ag acquired by DEC205-mediated endocytosis, pinocytosis, or phagocytosis. We find that conventional spleen DCs differ from all other cells tested in that they excel in Ag presentation irrespective of the route of Ag uptake and activation status. In contrast, the mechanism of Ag capture has a profound influence on the efficiency of Ag presentation by other APCs. For example, activated monocytes and GM-DCs (which are monocyte derived) are nearly as effective as conventional DCs in cross-presentation of Ags captured by DEC205-mediated and bulk phase endocytosis, but they are nearly inactive when the same Ags are captured by phagocytosis. Similarly, activated B cells are as effective as CD8+ DCs for MHC-II Ag presentation when the Ag is delivered by receptor-mediated endocytosis (DEC-205 or the B cell AgR), but the same cells are ineffective when the Ag enters the cell by bulk phase endocytosis. As has been previously documented, Ag uptake was at least 100-fold more efficient when delivered through specific receptors, compared with bulk phase pinocytosis (54). However, not all receptors deliver Ag to intracellular compartments with equal efficiency. For example, DEC-205 is more efficient in Ag internalization than is DCIR2 (26). When equivalent amounts of captured Ag are compared, however, the efficiency of presentation by DCs was similar for bulk phase and DEC205-mediated endocytosis. B cells differed from DCs in that Ags taken up by bulk phase pinocytosis were presented inefficiently when compared with receptor-mediated uptake. Unlike DCs, whose primary function is to initiate immunity, B cells present Ags to recruit specific cognate T cell help. The relative inefficiency at processing and presentation of Ags acquired by bulk phase endocytosis guarantees that T cell help remains focused during an immune response. Only B cells that capture Ag through specific AgRs will recruit T cell help. In contrast, the DCs’ ability to present a range of Ags acquired by pinocytosis serves to broaden the scope of T cell immunity. Several groups have suggested that cross-presentation is a specialized function of CD8+ DCs (27–29, 39), whereas others have come to the opposite conclusion (43, 55–57). However, many of these experiments failed to consider the amount or route of Ag capture. For instance, CD8+ DCs are far better at taking up dead cells than are CD8− DCs and therefore are favored in terms of presenting Ag contained in dead cells (41). Similarly, CD8+ DCs are the preferred Ag cross-presenting cells in viral (29, 58) or L. monocytogenes (27) infections; however, this, too, may be due to differential access to the Ag. We have shown that CD8+ DCs are enriched in components of the MHC-I processing pathway, but we did not measure the intrinsic MHC-I Ag presenting capacity of CD8+ versus CD8− cells directly (26). The data presented in this paper show that when the amount of Ag captured and the route of internalization are taken into consideration, the two subsets of conventional spleen DCs have similar abilities with regard to cross-presentation. In agreement with others, we found that there were small differences in MHC-I cross-presentation by the two DC subsets: CD8+ DCs were slightly more efficient than CD8− DCs after phagocytosis of OVA-adsorbed beads (40) and also after DEC205-mediated endocytosis when limiting numbers of DCs are compared. However, these differences were far less pronounced than the difference between either subset of DCs and APCs derived from monocytes. In contrast to cross-presentation, CD8− DCs are more efficient than CD8+ DCs and most other APCs tested for processing and presenting Ags in MHC-II, irrespective of the route of Ag acquisition or maturation status (26). Thus, in the steady state this subset may be key to maintaining CD4+ T cell tolerance to self-Ags (32, 59–61). Nevertheless, activation improves MHC-II presentation by CD8+ DCs and may enhance their ability to activate CD4+ T cells during infection. Activated monocytes, including GM-DCs and tip-DCs, share many features of conventional spleen DCs, but arise from distinct progenitors (8, 10, 22, 62). For example, whereas conventional DCs are normal in CCR2−/− mice, tip-DCs do not develop in the spleen of these mice after Listeria infection because monocytes fail to emigrate from the bone marrow (63). In addition, activated monocytes do not express characteristic DC lectins (DCIR2 or DEC-205), or high levels of Flk2 (FL receptor), but instead express the M-CSF receptor, like their monocyte progenitors (Supplemental Figs. 3D, 7B). Finally, CD8+ DCs and activated monocytes rely on different mechanisms to enhance cross-presentation (64). Although activated monocytes contribute to immunity against influenza (65), Lesihmania (66), and Listeria (23), they do not appear to be responsible for the initiation of adaptive immune responses. This is consistent with these cells’ lower levels of MHC-II surface expression and poor performance in MHC-II presentation, irrespective of the mechanism of Ag capture, including peptide pulsing. Notably, monocyte-derived DCs do not contribute significantly to the steady-state pool of DCs in lymphoid (8) and may only contribute to CD103− populations of CD11c+ cells in nonlymphoid organs (13, 14), which have poor T cell stimulation capacity (14, 67). Although they appear to be most closely related to activated monocytes and tip-DCs (62, 68), the physiologic counterparts of bone marrow-derived GM-DCs remain to be defined. GM-DCs can present Ags captured by DEC205-mediated or bulk phase endocytosis; these cells also transport MHC-II to the cell surface after activation by TLR ligation (6, 48, 50, 51). However, prior activation did not have a positive impact on their ability to present Ags to T cells. In contrast, FL-DCs resembled conventional spleen DCs in this important respect (i.e., Ag presentation was enhanced by activation through TLR ligation). In addition, mirroring their splenic counterparts, FL-CD8− DCs were better than FL-CD8+ DCs in activating MHC-II–restricted T cells. FL-DCs originate from the same progenitor (pre-DCs), rely on the same cytokine (FL) for differentiation and expansion, and are more similar to conventional DCs with regard to Ag processing and presentation. Thus, GM-DCs may not be the best cell type to investigate the role of conventional DCs in immune responses. In keeping with the idea that the primary function of activated monocytes and GM-DCs might be as innate immune effector cells that destroy phagocytized Ag (23, 62), these cells were far less efficient in presenting phagocytized Ag than were conventional DCs. This observation is consistent with the finding that monocyte-derived mononuclear phagocytes tend to have more developed lysosomes that may hamper the escape of processed peptides into MHC loading compartments (7, 69). We have shown that cell intrinsic differences have a profound impact on Ag handling for MHC-II and cross-presentation. Although most APCs studied have the ability to process Ag, in non-DCs the route of Ag capture has a profound impact on its subsequent processing and presentation. Our observations have significant implications for understanding the development of adaptive immune responses and targeted vaccination strategies. We thank C.G. Park for cells producing rFL, K. Yao for production and purification of rFL, D. Bosque and T. Eisenreich for genotyping and caring for mice, E. Pamer for L. monocytogenes, T. Schwickert for B1-8hi mice, C.G. Park and C. Chong for CD11c-hDEC mice, G. Begley (Amgen) for GMCSF-Rβ–deficient mice, K.Velizon and O. Uche for the multiple long sorts, C. Bare from The Rockefeller University Flow Cytometry facility for operating the Image Stream100 flow cytometer, members of the laboratory, and R.M. Steinman for helpful discussions and critical reading of the manuscript. This work was supported in part by National Institutes of Health Grant AI051573. M.C.N. is a Howard Hughes Medical Institute investigator. D.D. is supported by German Research Foundation Grants DU548/1-1 and DU548/2-1. A.O.K. was supported by a Cancer Research Institute fellowship.
. 1973. Identification of a novel cell type in peripheral lymphoid organs of mice. I. Morphology, quantitation, tissue distribution. J. Exp. Med. 137: 1142–1162.
. 1978. Lymphoid dendritic cells are potent stimulators of the primary mixed leukocyte reaction in mice. Proc. Natl. Acad. Sci. USA 75: 5132–5136.
. 1980. Dendritic cells are accessory cells for the development of anti-trinitrophenyl cytotoxic T lymphocytes. J. Exp. Med. 152: 1070–1084. 2007. Dendritic cells: understanding immunogenicity. Eur. J. Immunol. 37(Suppl 1): S53–S60.
. 2009. In vivo analysis of dendritic cell development and homeostasis. Science 324: 392–397.
. 2006. A clonogenic bone marrow progenitor specific for macrophages and dendritic cells. Science 311: 83–87.
. 2007. Monocytes give rise to mucosal, but not splenic, conventional dendritic cells. J. Exp. Med. 204: 171–180.
. 2007. Identification of clonogenic common Flt3+M-CSFR+ plasmacytoid and conventional dendritic cell progenitors in mouse bone marrow. Nat. Immunol. 8: 1207–1216.
. 2007. Development of plasmacytoid and conventional dendritic cell subtypes from single precursor cells derived in vitro and in vivo. Nat. Immunol. 8: 1217–1226.
. 2009. Intestinal lamina propria dendritic cell subsets have different origin and functions. Immunity 31: 502–512.
. 2009. Origin of the lamina propria dendritic cell network. Immunity 31: 513–525.
. 2009. The origin and development of nonlymphoid tissue CD103+ DCs. J. Exp. Med. 206: 3115–3130.
. 2008. The receptor tyrosine kinase Flt3 is required for dendritic cell development in peripheral lymphoid tissues. Nat. Immunol. 9: 676–683.
. 2007. Origin of dendritic cells in peripheral lymphoid organs of mice. Nat. Immunol. 8: 578–583.
. 2004. Visualizing dendritic cell networks in vivo. Nat. Immunol. 5: 1243–1250.
. 2002. Mouse and human dendritic cell subtypes. Nat. Rev. Immunol. 2: 151–161.
. 1999. Differentiation of phagocytic monocytes into lymph node dendritic cells in vivo. Immunity 11: 753–761.
. 2003. Blood monocytes consist of two principal subsets with distinct migratory properties. Immunity 19: 71–82.
. 2006. Intrasplenic steady-state dendritic cell precursors that are distinct from monocytes. Nat. Immunol. 7: 663–671.
. 2003. TNF/iNOS-producing dendritic cells mediate innate immune defense against bacterial infection. Immunity 19: 59–70.
. 1994. Efficient presentation of soluble antigen by cultured human dendritic cells is maintained by granulocyte/macrophage colony-stimulating factor plus interleukin 4 and downregulated by tumor necrosis factor alpha. J. Exp. Med. 179: 1109–1118.
. 2005. CD8alpha+ dendritic cells selectively present MHC class I-restricted noncytolytic viral and intracellular bacterial antigens in vivo. J. Immunol. 175: 196–200.
. 2009. Contribution of direct and cross-presentation to CTL immunity against herpes simplex virus 1. J. Immunol. 182: 283–292.
. 2008. Batf3 deficiency reveals a critical role for CD8alpha+ dendritic cells in cytotoxic T cell immunity. Science 322: 1097–1100.
. 2002. Role of antigen receptor affinity in T cell-independent antibody responses in vivo. Nat. Immunol. 3: 399–406.
. 1995. Hematopoietic and lung abnormalities in mice with a null mutation of the common beta subunit of the receptors for granulocyte-macrophage colony-stimulating factor and interleukins 3 and 5. Proc. Natl. Acad. Sci. USA 92: 9565–9569.
. 1990. Removal of endotoxin from protein solutions by phase separation using Triton X-114. J. Immunol. Methods 132: 191–195.
. 2004. Stimulus-dependent requirement for granulocyte-macrophage colony-stimulating factor in inflammation. J. Immunol. 173: 4643–4651.
. 2000. Generation of murine dendritic cells from flt3-ligand-supplemented bone marrow cultures. Blood 96: 3029–3039.
. 2005. Cutting edge: generation of splenic CD8+ and CD8- dendritic cell equivalents in Fms-like tyrosine kinase 3 ligand bone marrow cultures. J. Immunol. 174: 6592–6597.
. 2007. In vivo imaging of germinal centres reveals a dynamic open structure. Nature 446: 83–87.
. 2000. CD8(+) but not CD8(-) dendritic cells cross-prime cytotoxic T cells in vivo. J. Exp. Med. 192: 1685–1696.
. 2002. The CD8+ dendritic cell subset selectively endocytoses dying cells in culture and in vivo. J. Exp. Med. 195: 1289–1302.
. 2002. Constitutive versus activation-dependent cross-presentation of immune complexes by CD8(+) and CD8(-) dendritic cells in vivo. J. Exp. Med. 196: 817–827.
. 2002. Cross-presentation of cell-associated antigens by CD8alpha+ dendritic cells is attributable to their ability to internalize dead cells. Immunology 107: 183–189.
. 1999. Definition of dendritic cell subpopulations present in the spleen, Peyer’s patches, lymph nodes, and skin of the mouse. Blood 93: 590–598.
. 2002. Comparative analysis of murine marrow-derived dendritic cells generated by Flt3L or GM-CSF/IL-4 and matured with immune stimulatory agents on the in vivo induction of antileukemia responses. Blood 100: 4169–4176.
. 1997. Developmental regulation of MHC class II transport in mouse dendritic cells. Nature 388: 787–792.
. 2000. The formation of immunogenic major histocompatibility complex class II-peptide ligands in lysosomal compartments of dendritic cells is regulated by inflammatory stimuli. J. Exp. Med. 191: 927–936.
. 2003. Activation of lysosomal function during dendritic cell maturation. Science 299: 1400–1403.
. 2006. Surface expression of MHC class II in dendritic cells is controlled by regulated ubiquitination. Nature 444: 115–118.
. 1995. Tissue distribution of the DEC-205 protein that is detected by the monoclonal antibody NLDC-145. I. Expression on dendritic cells and other subsets of mouse leukocytes. Cell. Immunol. 163: 148–156.
. 1995. The receptor DEC-205 expressed by dendritic cells and thymic epithelial cells is involved in antigen processing. Nature 375: 151–155.
. 2002. Antigen presentation capacity and cytokine production by murine splenic dendritic cell subsets upon Salmonella encounter. J. Immunol. 169: 108–116.
. 2009. Receptor-mediated phagocytosis elicits cross-presentation in nonprofessional antigen-presenting cells. Proc. Natl. Acad. Sci. USA 106: 3324–3329.
. 2007. Differential development of murine dendritic cells by GM-CSF versus Flt3 ligand has implications for inflammation and trafficking. J. Immunol. 179: 7577–7584.
. 2009. Different cross-presentation pathways in steady-state and inflammatory dendritic cells. Proc. Natl. Acad. Sci. USA 106: 20377–20381.
. 2009. Intestinal CD103+, but not CX3CR1+, antigen sampling cells migrate in lymph and serve classical dendritic cell functions. J. Exp. Med. 206: 3101–3114.
. 2008. Novel insights into the relationships between dendritic cell subsets in human and mouse revealed by genome-wide expression profiling. Genome Biol. 9: R17.
. 1967. The uptake and digestion of iodinated human serum albumin by macrophages in vitro. J. Exp. Med. 126: 941–958.